The water was a bit higher than yesterday on the way down, and we had to winch a couple of the 4-wheelers out of deeper mud, but we got to the site with not too much trouble. We put a stick in a the high water mark so we could see what the ocean was doing and went to work on the structure. 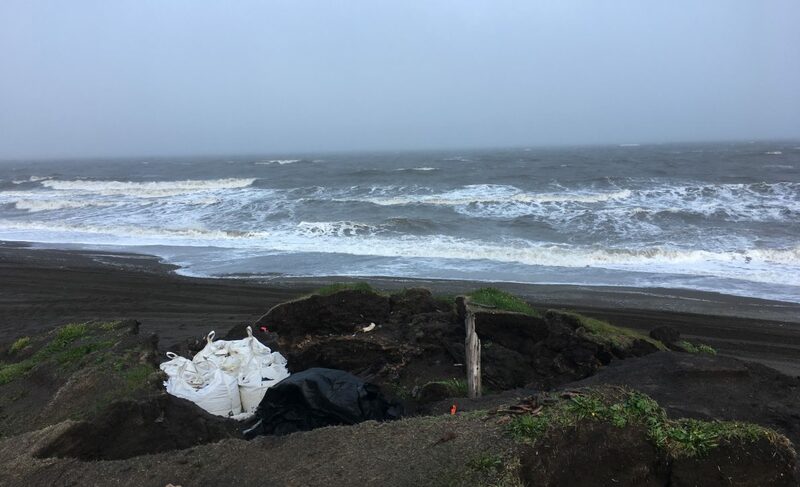 Yesterday, the strong winds made water screening where we have to do it a pretty sure ticket to hypothermia, so we tried just dry screening on the beach in the shelter of the bluffs, and it worked well. Dry screening on the beach. We made pretty good progress on the excavation. 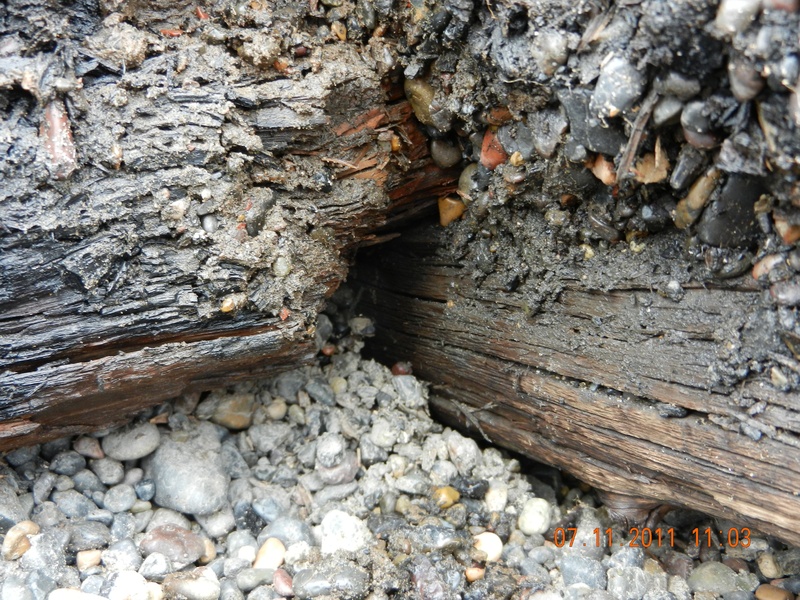 More logs were exposed in both of the parallel log features (fallen walls?). 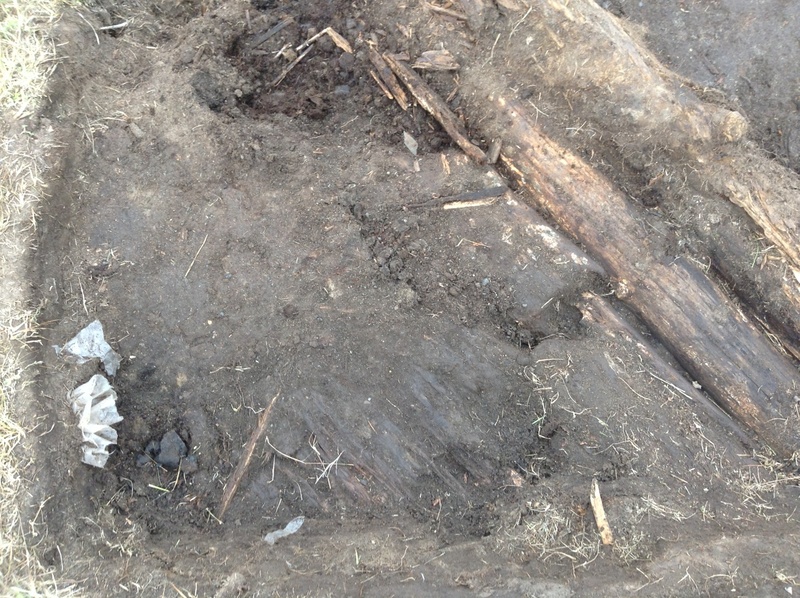 The area between the logs is getting soft, and seems to contain a lot of animal bones, many of which are lying in a way suggesting they were tossed into a depression. South of the southern logs, we uncovered what appears to be part of a plank floor, maybe for a tent, since it doesn’t seem deep enough for a house. Next to, but apparently not on it, there was a cluster of ceramic sherds, including a large rim sherd. This was right under an old looters pit, and their activity may have broken the pot. Ceramic sherds at lower left (with Visqueen sticking out of the wall above them), plank floor in lower center, south logs at right, and arrow shafts at top center. 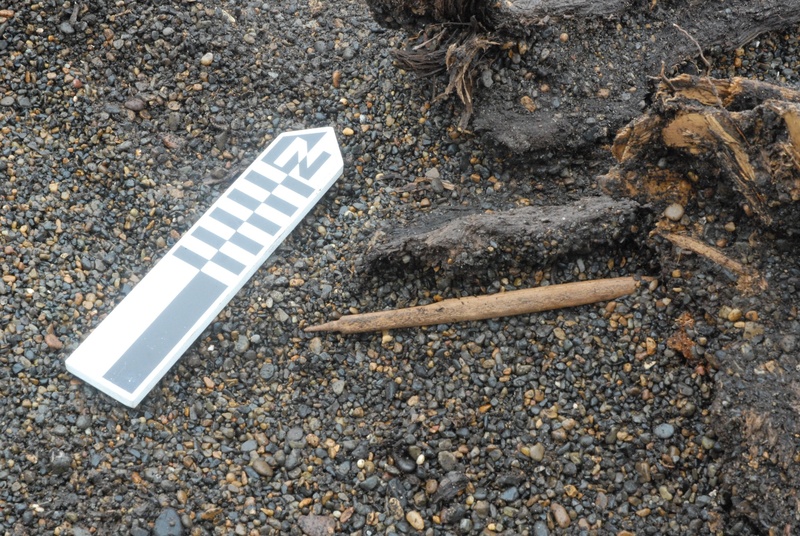 Beside the logs, but again not on the plank floor, we found two arrow shafts, apparently associated with a strip of baleen, and a fragment of bird hide. A couple of pieces of hide, one sewn, had been found just above this. This could be the remains of a quiver, or possibly a work bag, since there was a ground slate knife blade fragment and a worked piece of chert nearby. We’ll continue there tomorrow. We didn’t stay out as long as we might have, since the waves seemed to be coming higher up the beach. It turned out to be a good thing. Going back to town was a bit of an adventure for us, although only one of us got stuck, but even more so for a man & his son we met on the way. They were trying to head out towing a trailer, and had gotten really stuck in a deep soft spot. It looked like they had been there a while trying to get out. We were able to get one of the 4-wheelers with a winch to where we could pull them out, and then waited until they got turned around and back on the town side. The hole just missed it. The DWF (Ipiutak) levels had their own surprises. We found a good bit of fish bone, some lithics (nothing diagnostic) and a lot of broken bone, but the really cool thing, which I found on the edge of the hearth, was a flattened but apparently complete egg! We were a small crew today since the high school students weren’t working, so we concentrated on the Ipiutak area. It was fairly tricky to excavate, since there is unconsolidated gravel under the Wood/sand/gravel layer that covers the Ipiutak surface, and a large pile of unconsolidated gravel uphill from the features. Plus the hearth ash is covered with a mushy skin of peat, and both the hearth surface and the peat undulate. Despite that, we recovered 2 fin rays, some burnt bone, a pot-lidded flake (probably rhyolite), a grey chert flake, and a black biface fragment from the hearth. We also got some large ungulate (species in dispute at the moment–probably caribou) bone, and a small fragment of decorated ivory, plus several interesting pieces of wood, which appear to be worked. It was quite cold. Even though we had a windbreak, the levels are just thawing, and the ground is cold and wet. My hands are still stiff, so more will have to wait until tomorrow. …and a full crew. We started work on the burial under the plank. It took quite a while, as the plank was complex to define. It was all one piece, in some places up to 9 cm thick, and had obviously required a great deal of work and skill to make. The top surface looked like the outer surface of the tree. 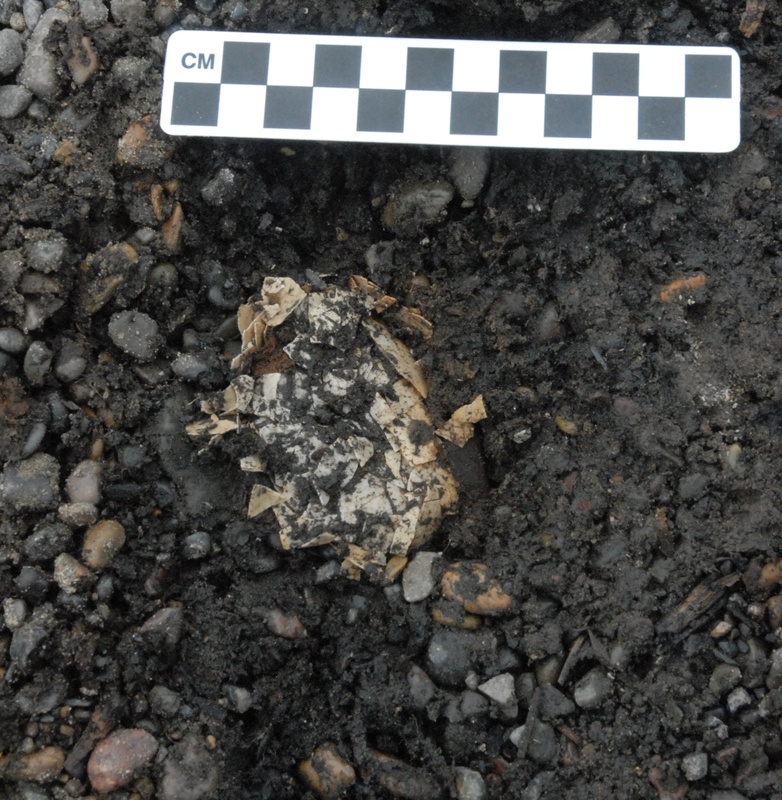 The bottom surface showed evidence of burning, in some areas completely charcoal. It should be good for C14 dating. The remains are those of a large male. Preservation is a bit variable, but it looks like there might be some ribs that could yield aDNA. In any event, he will be safely out of the trail. Many on the crew did STPs. So far nothing has shown up. It is beginning to look as if there is a gap in the burials (or at least a much thinner distribution). I’ve begun to wonder if this could be the result of a village move due to erosion, which brought the village close to the cemetery and made them skip a bit of ground to put the new cemetery at a proper distance from their residences. At least it was a beautiful day. After a day off, we were back in the field today. 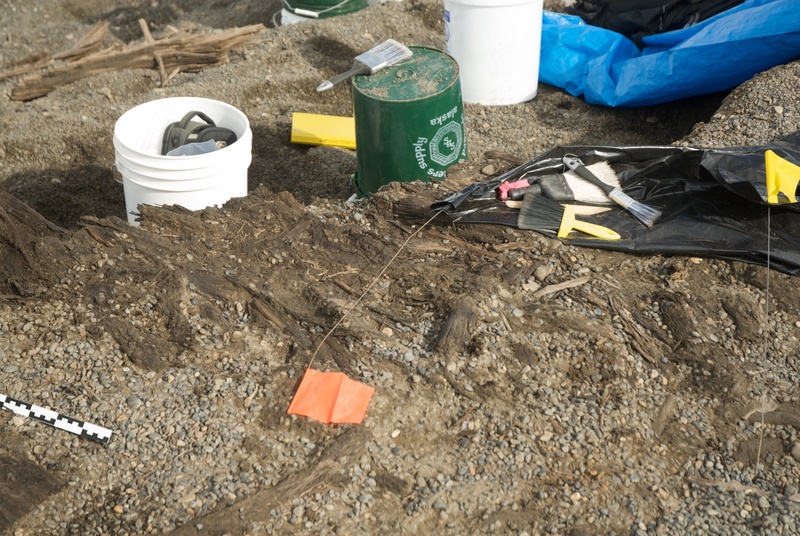 The GPR hits we tested were mostly concentrations of water, and buried whale bones (not part of graves, unless it was a whale grave). However, we also looked at two other areas that had turned up in the trails on the first day’s walkover. One proved to be nothing but a concentration of refuse. The other wasn’t looking much more promising, with peat and a little wood, but we took it down to expose all the wood, and low and behold, a very large piece of wood indeed, which is a burial cover. We will have to excavate that tomorrow. There will also be a new set of GPR results to test. The burial cover exposed. That is one piece of wood! The dustpan is covering what may be a bone, so the photo can be used for the public. There is also some wood exposed on the erosion face at what looks like the Ipiutak level, including something that looks like architecture. Notched log resting on another log. Ipiutak? 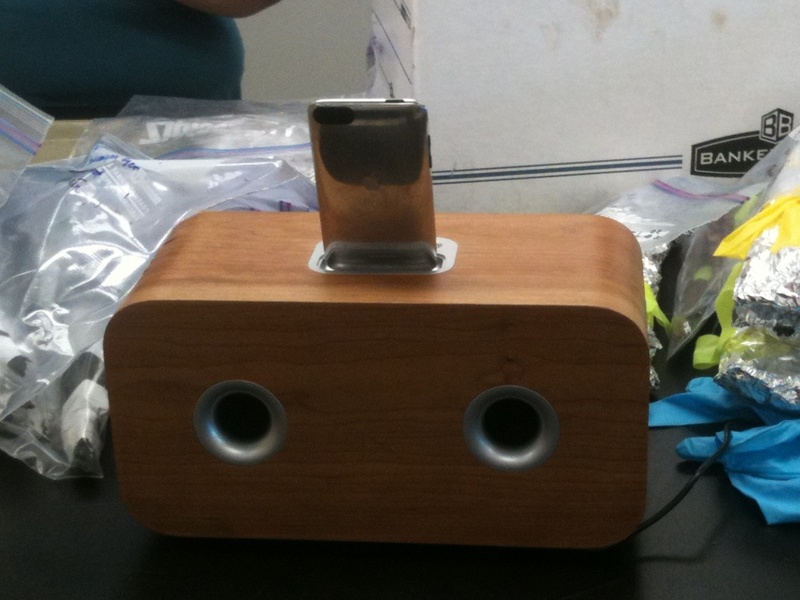 Claire Alix, who is probably the world expert on precontact wood use in Alaska, is in Barrow for a 10-day stint of analyzing wood from Nuvuk. She is working on wood from the Driftwood Feature (DWF), because there is so much of it and we need to figure out what needs to be kept. The DWF was a storm strand line which was washed up onto and mixed with an Ipiutak settlement. Not just any Ipiutak settlement, but the farthest north Ipiutak settlement by about 500 km. 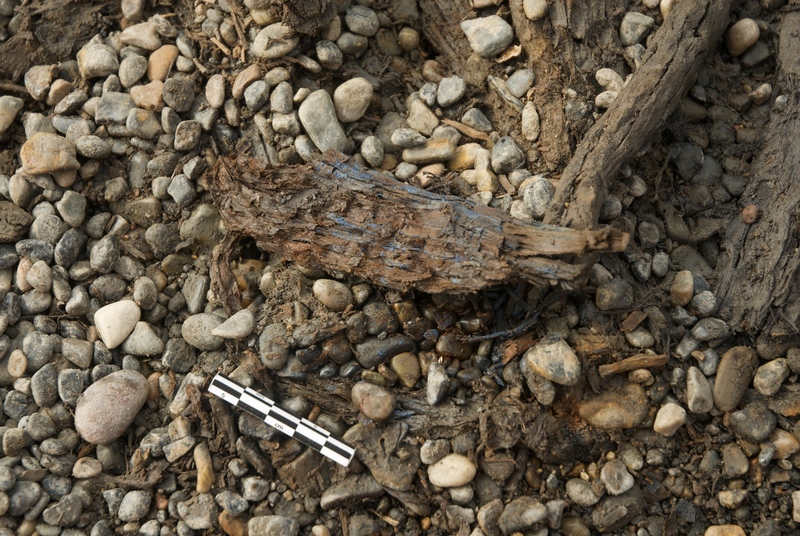 The result was a mass of wood, bark and marine invertebrates, with a number of clearly identifiable artifacts included. There was so much wood that we called the level “Wood/Sand/Gravel” because it seemed like there was more wood than matrix. However, some of the smaller pieces of wood and bark were also worked, but it seems that the storm picked up smaller floatable artifacts and mixed them with driftwood. 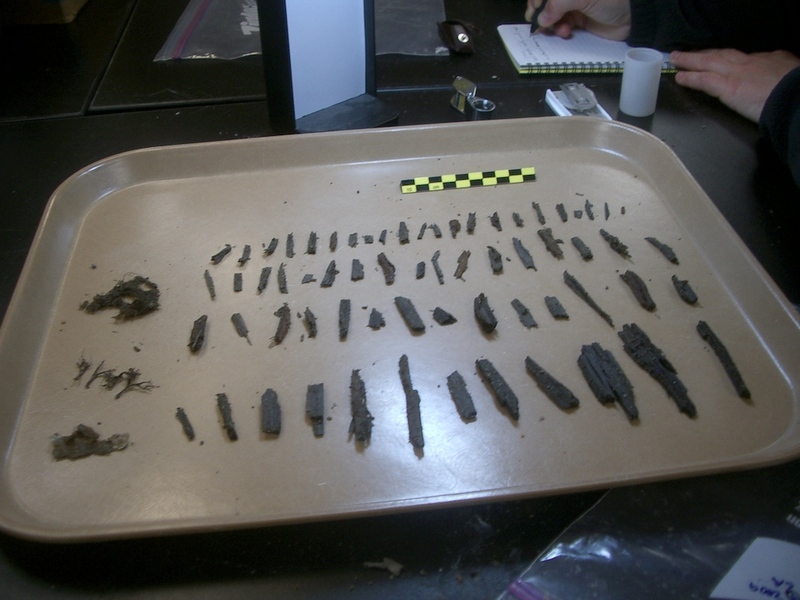 Given the field situation, it was impossible to examine each small piece of wood in detail, so we erred on the side of caution and brought back a lot of things that probably aren’t artifacts, so they could be examined in a nice warm lab. 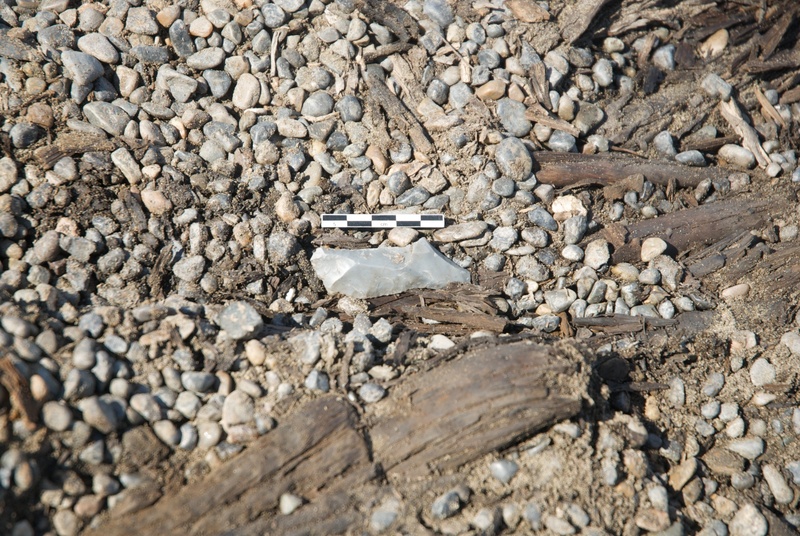 Chert artifact stands out in the middle of huge numbers of small pieces of wood, some worked and some not. Wood level in the DWF. All this is pretty laborious. Claire has to do the analysis and wood IDs, but with her schedule we needed to find a way to speed things up. The initial sorting of bags of wood and the wrapping of the wood are two of the most time-consuming aspects of the process. So, last week Heather Hopson came in to do some data entry and initial sorting, and this week Trina Brower is joining Heather. They are doing the initial sorts, wrapping with Teflon tape & data entry, so Claire can keep looking at wood. Heather & Trina hard at work in the lab. Wrapping the delicate pieces of small wood is definitely fiddly work. It certainly helps having someone to work with & talk to while working. Wrapping an artifact to keep it together while it dries. The processing of the large bulk samples is proceeding. It’s slow going, but we are reducing the overall volume. We have found a few things that are noteworthy. Claire has found some well-preserved wood that she was able to take samples of for species identification and possible tree-ring dating. There are also a variety of marine worms, shells and what we think are marine plants. I just spoke to a friend of mine, “retired” biologist, Dr. Dave Norton, who used to live in Barrow and is fairly familiar with the contents of modern strand lines here. Claire is going to take the oddities we are sorting out down to Fairbanks (where he lives) tomorrow night, and he will look at the specimens and try to connect with the appropriate curators at the UAF Museum of the North. I’m going to Fairbanks (for shotgun refresher qualifications for a non-archaeology project I manage for Sandia National Labs) the week after next, and will go visiting the curators with him, in hopes of getting good IDs. One of the great things about doing archaeology in the Arctic is that the preservation can be spectacular. Artifacts often froze the winter after they were abandoned, and only thawed when they were excavated. This means we get to find a lot of the bone, wood ivory and leather items that were undoubtedly part of most precontact people’s tool kits. We don’t have to guess at what people were using or extrapolate from a few stone tools that did manage to be preserved; we can see it firsthand. This is not always an unmixed blessing. Arctic archaeology sometimes suffers from an embarrassment of riches. Boxes with wood from the Driftwood Feature (DWF). In the past, archaeologists generally only saved the artifacts from a site. 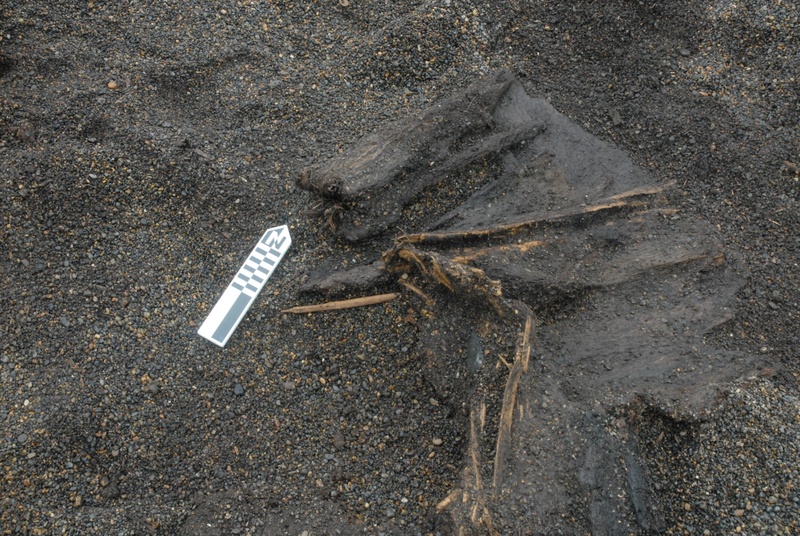 Animal bones and soil were pretty much ignored, or at best documented in the field (there are a lot of excavated houses in the Arctic where the animal bones are still piled at the edge of the excavation where they were left decades ago). As archaeological science advanced (radiocarbon dating began about 60 years ago) and people began to do more things with faunal (animal) remains and soil samples, people began to collect a lot more, and to bring it back to museums to save, on the assumption that one day someone would be able to do something informative with it. The idea is still a good one in theory, but it is bumping up against various realities. For one thing, in most areas these sorts of things require storage in climate controlled conditions or they will deteriorate and become useless. They are often quite bulky compared to just the artifacts. Most museums simply don’t have any place to put all this stuff! Some of the better-funded places, like the Smithsonian Institution, have built large off-site storage facilities in areas where real estate is a bit less expensive, just to keep all this stuff. But such places require operational funds and new staff, and that costs money too. Most places can’t really afford that. Some institutions have started charging for putting collections there, but there are problems with that as well. 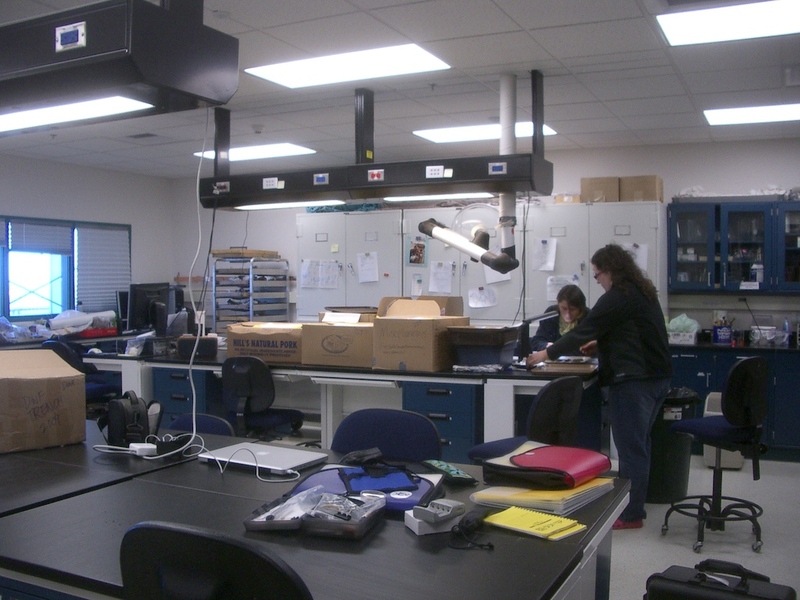 So part of the new reality for archaeology is that we can’t keep everything. The question is how to decide what to keep and what not to keep. In general, the artifacts are kept. No problem there. The issue is how to deal with the other things. 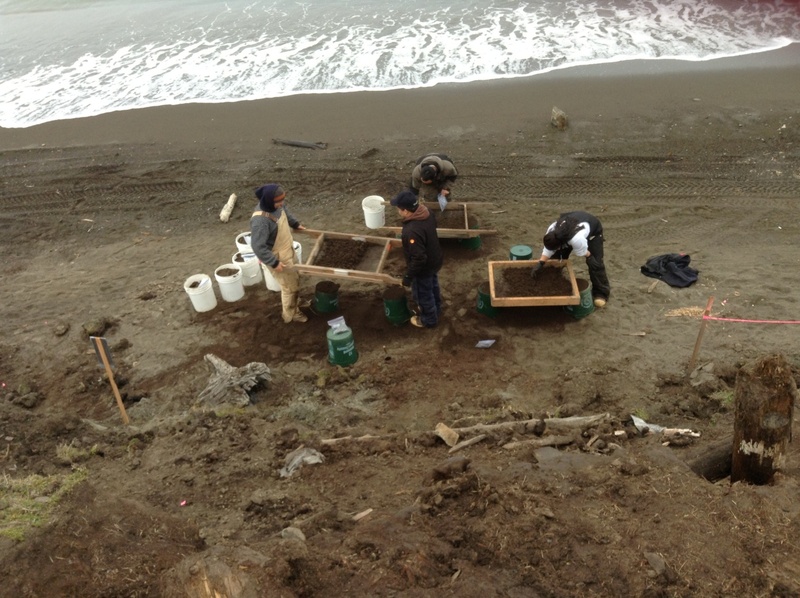 It’s even more complicated for the Nuvuk project. We have had several areas where massive amounts of organic material, with some artifacts and faunal remains mixed in, were encountered. While one might normally choose to excavate this all in the field, in a couple of cases the areas were right at the erosion face, and could literally have vanished overnight. Combine that with a very cold field situation, where mild hypothermia can dull excavators’ thought processes, it didn’t seem like that was the best plan, since it risked data in a variety of ways. I decided to take tightly-provenienced (with very accurate information on where they were from) bulk samples, which can then be processed in the lab, where it is warm and we have good lighting, magnifying lenses and water to wash the dirt and gravel off so we can get a good look at everything. If excavators recognize an artifact in the field, it gets recorded there, but the idea is that we’ll find the less obvious ones in the lab. Contents of one bucket shot laid out on a tray. 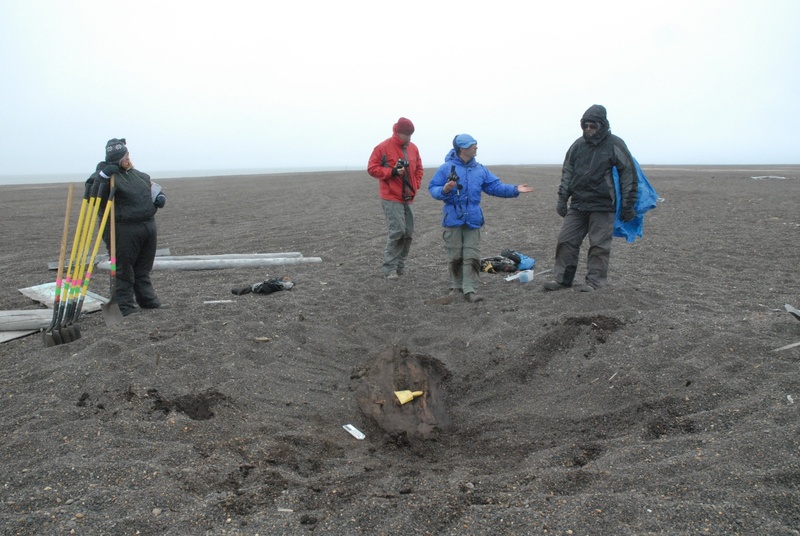 One of the areas with a massive amount of organic material was what we called the Driftwood Feature. This level is about 1 meter (39 inches) below the Thule graves. It was actually permanently frozen, and therefore everything organic was in great shape. It looks like there was an Ipuitak dwelling (maybe there were more that had already eroded–we don’t know) on a ridge near the ocean. Sometime between 300-400 AD there was a huge storm, which washed all sorts of things (driftwood, bark, marine invertebrates, shellfish, peat, etc.) up onto the beach, all the way up to where the people were living. It left what is called a strand-line. It looks like they either left in a hurry and didn’t come back, or didn’t survive, since a number of artifacts were still there. The strand-line continued along what had been the beach ridge, and we wanted to see if there was any evidence of more human activity besides the one dwelling. Because there was so much wood, and a number of the artifacts at the dwelling had been wood, we had a needle in a haystack problem, with the haystack about to fall into the ocean (which it did the next winter). So we bulk sampled. Close-up of the Ipiutak layer at DWF. We excavated many square meters of this! Now we are going through some of the bulk samples. 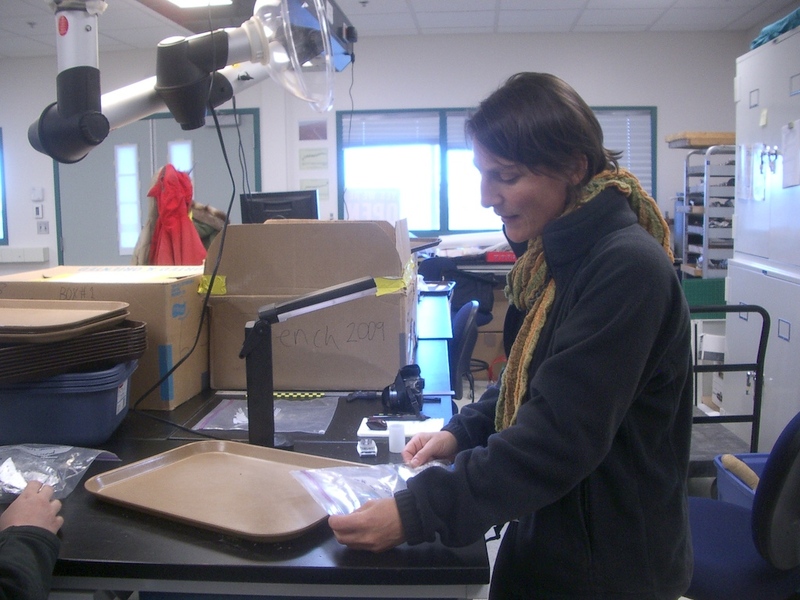 I’ve been very lucky to have Dr. Claire Alix, a French scholar who specializes in Arctic driftwood and its use by humans, involved with the project since the very early days. She was based in Fairbanks, Alaska, for many years, but has recently gotten a teaching and research position at the Sorbonne in Paris. This is wonderful, since Claire is a great person & really deserves it, but it certainly complicates the logistics of her research on this wood! 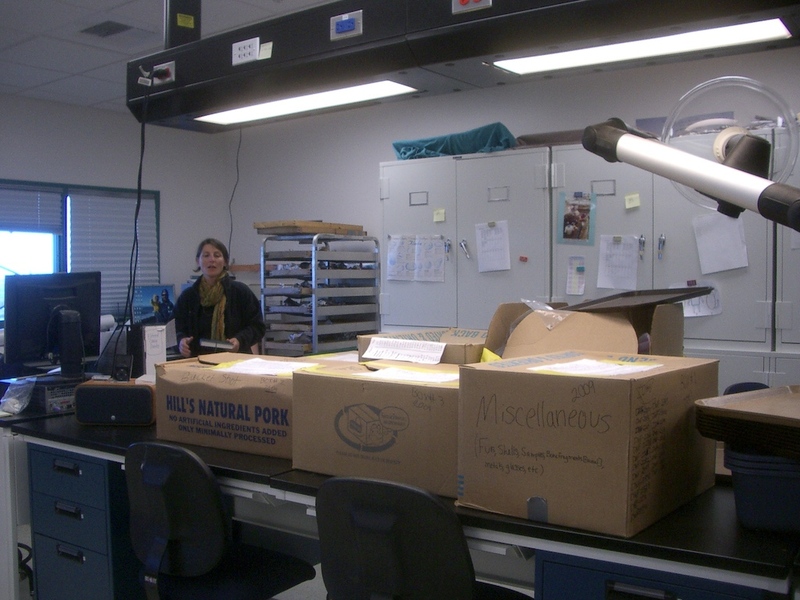 Claire arrived on this morning’s plane, and is already hard at work going through samples from 2009 which were excavated after she left the field. 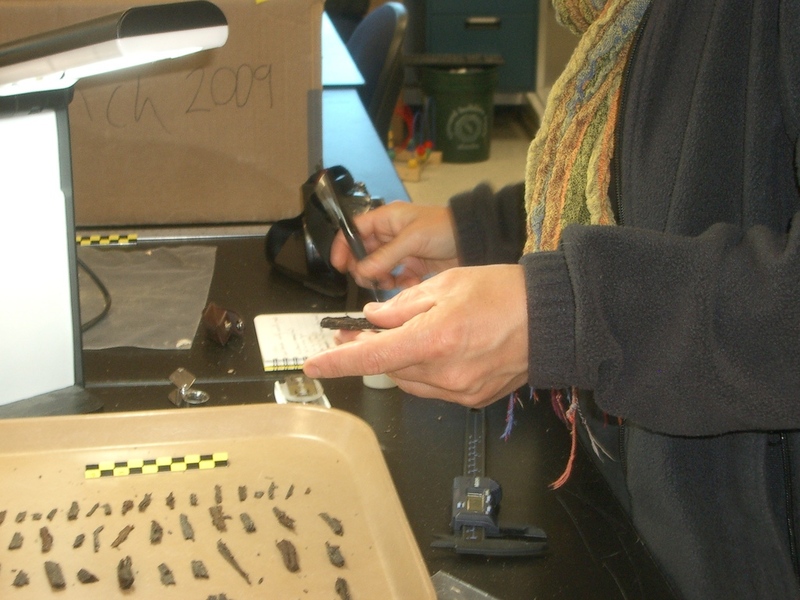 She is looking for all worked (altered by people) items, picking out things that we can’t yet identify for further examination, and recording amounts & types of wood, bark, and other identifiable organics. 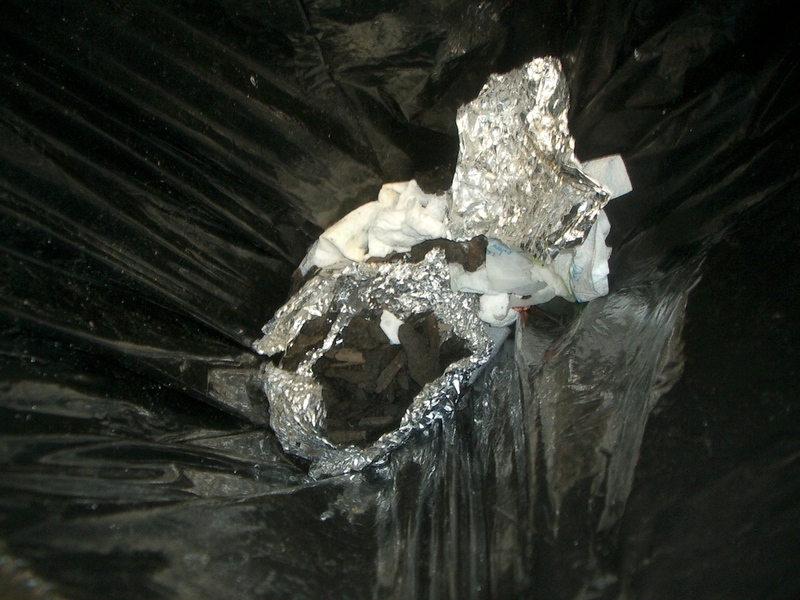 The non-worked identified material is then being lab discarded. I’ve got the computer map up and color-coded so Claire can look at it when she needs to, Laura is unwrapping the samples, and I’ll probably end up doing the data entry in the catalog. She leaves again on Wednesday night, and won’t be back in the US until sometime after January, so we’ve got a lot to do, and not much time to do it. Claire and Laura hard at work. Lab discards--on closer examination they turned out not to be cultural. Later this fall we are going to start going through soil samples and so forth. We hope to be able to reduce the volume they take up. Some of that will be done by separating the actual sample material of interest from the gravel matrix. Where that isn’t possible (for example with large logs or whalebone) we will have to sub-sample, retaining only a portion of the total sample volume. Otherwise, we’re going to run out of room.